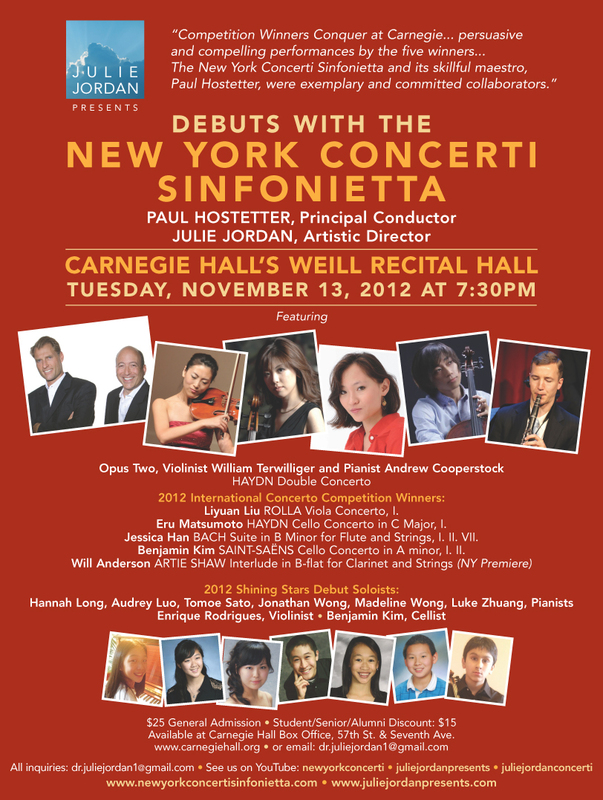 November 13, 2012, Tuesday at 7:30pm Weill Recital Hall at Carnegie Hall. General Admission: $25 Discount tickets: Students/Seniors/Alumni. Tickets available: www.carnegiehall.org Carnegie Hall Box Office W.57th St./Seventh Avenue. Opus Two, Violin/Piano Duo: William Terwilliger and Andrew Cooperstock, 2012 International Concerto Competition Winners: Violist Liyuan Liu, Cellist Eru Matsumoto, Flutist Jessica Han, Cellist Benjamin Kim, Clarinetist Will Anderson are featured with the New York Concerti Sinfonietta, Paul Hostetter Principal Conductor. Also on the program are the 2012 Shining Stars Debut Soloists: Pianists Luke Zhuang, Madeline Wong, Hannah Long, Jonathan Long, Violinist Enrique Rodrigues, Cellist Benjamin Kim.